Andres Iniesta: "Cristiano Ronaldo injury is an important loss for Real Madrid"
23.03.2011 » Iniesta: "Cristiano Ronaldo injury is an important loss for Real Madrid"
Andrés Iniesta ranked Cristiano Ronaldo as one of the best players in the World. The Spanish midfielder added that Cristiano Ronaldo injury will make Real Madrid less stronger. Andrés Iniesta, Barcelona midfielder and one of the best players in the World, said recently that Cristiano Ronaldo injury represents a very important loss to Real Madrid. CR7 will be forced to miss Portugal's next two matches against Chile and Finland is still doubtful for Real Madrid games against Sporting Gijon (La Liga BBVA) in the 2nd of March and Tottenham Hotspurs for the UEFA Champions League quarter finals first leg. Iniesta noted that Cristiano Ronaldo is "one of the best players in the World" and for that reason, Real Madrid can suffer from his absence. 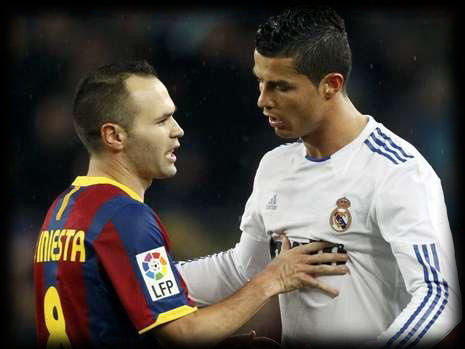 Iniesta: "Cristiano Ronaldo is an important loss for Real Madrid. It's always complicated for a team not to be able to count with a player like Ronaldo", said the Spanish midfielder. Iniesta: "I don't know how Real Madrid will react to this loss, but they have a very good team. The club has a very good squad, with plenty of quality players with enough quality to replace anyone."